Bingo is a popular past time here in the US mostly for older people. It's usually held in a town hall or some place where people from all walks of life can join in and have fun. 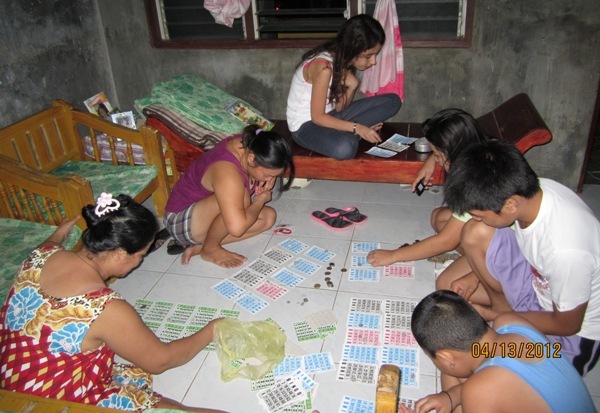 Back home, Bingo is something my family does quite regularly at home. It's all for fun of course and it's usually just them. So what can be a better way to welcome our little one than introduce her to this fun game, eh? That's exactly what they did on our very first night there. The little one knew of the game before but never actually played it so it was a blast for her. They usually have money involve when they play [thye pay a peso per card] but I told the little one she could just join in and not have any money...you know, just for fun. But guess what?? She WON the first game! So even if she didn't place down any money, they still let her have the 'pot'. She was of course thrilled to have won the first round of the game. She would have wanted to play the game again but wasn't able to because she got busy playing some other 'kids' games. Ha!